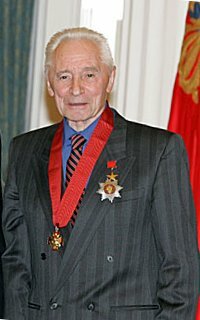 Yury Grigorovich after receiving the Order of Merit for the Fatherland award in 2007. Yury Nikolayevich Grigorovich (Russian: Ю́рий Никола́евич Григоро́вич; born 2 January 1927 in Leningrad), HSL, PAU, is a Soviet and Russian dancer and choreographer who dominated the Russian ballet for 30 years. Grigorovich was born into a family connected with the Imperial Russian Ballet. He graduated from the Leningrad Choreographic School in 1946 and danced as a soloist of the Kirov Ballet until 1962. His staging of Sergey Prokofiev's The Stone Flower (1957) and of The Legend of Love (1961) brought him acclaim as a choreographer. In 1964 he moved to the Bolshoi Theatre, where he would work as an artistic director until 1995. His most famous productions at the Bolshoi were The Nutcracker (1966), Spartacus (1967), and Ivan the Terrible (1975). He controversially reworked Swan Lake to produce a happy end for the story in 1984. In 1995, he was accused of having allowed the theatre to plunge into stagnation and after many a squabble was ousted from office. Thereupon he choreographed for various Russian companies before settling in Krasnodar, where he set up his own company. Grigorovich has been heading the juries of numerous international competitions in classical ballet. After the death of his wife, the great ballerina Natalia Bessmertnova, on 19 February 2008, he was offered the opportunity to return to the Bolshoi again in the capacity of ballet master and choreographer. 1957 - Medal "In Commemoration of the 250th Anniversary of Leningrad"
1970 - Jubilee medal "For Valiant Labour. To commemorate the 100th anniversary of the birth of Vladimir Ilyich Lenin"
1977 - Medal "100 years of Bulgaria's Liberation from Ottoman slavery"
2002 - Badge of "370 years of Yakutia in Russia"
2003 - National Theatre Prize Golden Mask in nomination "For the honour and dignity"
2004 - Badge of Honor of the Ministry of Culture and the Arts "for his personal contribution to the development of art"
2005 - The highest theatrical award of St. Petersburg "Gold soffit"
2006 - Award "Russian National Olympus" in nomination "Man epoch", medal "For the honor and valor"
Wikimedia Commons has media related to Yuri Grigorovich. This page was last edited on 10 February 2018, at 11:20 (UTC).